C.P. Shipley was born in Wooster, Ohio but became one of the most successful businessman in the saddlery, bit, and spur business in the late 1800s. He opened the Shipley Saddlery and Mercantile Company in Kansas City in 1885 and quickly grew the business and expanded into a larger location. By 1910 Shipley’s son Clyde has joined the company and it was incorporated as they moved into a huge 3 story building at 17th and Genesee Streets in Kansas City. Shipley was by this time selling not only saddles, harnesses, boots, bridles, and all types of leather goods and saddlery items and was selling bits and spurs manufactured by Buermann and McChesney. In 1915, Shipley bought out G.A. Bischoff’s company in Texas and added the manufacturing capacity for bits and spurs to his previous saddlery and supply company after a disagreement with McChesney’s company. Shipley never managed to excel at a large scale producing bits and spurs as his distribution network was not able to create enough demand. He later sold his bit and spur making tools and business to Oscar Crockett who moved it across the street as the Crockett Bit and Spur Company. Shipley bits and spurs are very collectible and are interesting as Shipley was able to buy bits and spurs from Buermann and McChesney, but had them marked as Shipley Spurs. Markings: Spurs were marked “C.P. 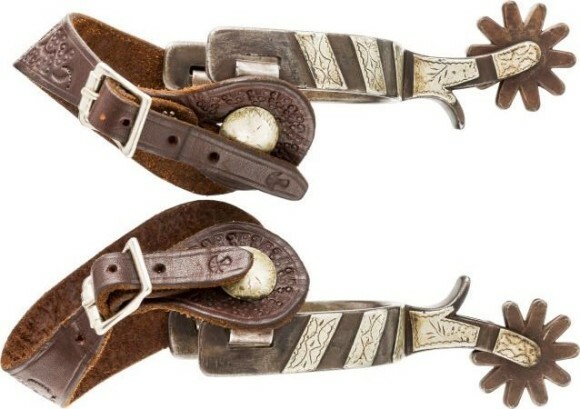 SHIPLEY” in the heelband of one spur and “KAN. CITY MO”, Bits were marked “C.P. SHIPLEY” inside one cheekpiece and “KAN. CITY MO.” inside the other. For help with identification, or appraisal of your C.P. Shipley bit or spurs, please Contact Us. Click here for information on Shipley Maker’s Marks.